Sometime earlier in the year I fancied a trip to Rhinebeck. To not only experience the Sheep & Wool festival, but also to stock up on US indie dyed yarn 'cos it's so ridiculously expensive to ship odd skeins and then pay customs charges on top. Carol Feller and I are both sponsoring the Indie Untangled show on the Friday, and I'm preparing marketing materials for indie dyers and knitters who buy indie dyed yarn. This all ties in very nicely with a few plans I've put time into to replace what used to be the print wholesale before I needed to shut down that side of the business. I don't know yet when those materials will be ready, but hopefully before this season is done! We're arranging a meet up at the main Rhinebeck show for Woolly Wormhead fans and there'll be more about that in the discussion thread in my Ravelry group. ... and there just happened to be a design in my head that needed out onto the needles. I've been beyond stressed this week and the panic attacks are creeping back, and the black dog is doing it's worst. Knitting this has helped keep me anchored. and doesn't it create such a beautiful fabric? The pattern is almost written and ready for editing, and I'm trying to arrange a photoshoot. This isn't something that's gone too smoothly of late but fingers crossed, eh? The Lateralis collection is now with the graphic designer, and I'm hoping for a cover soon so that I can put it up on pre-release. The single patterns are all done but it won't be ready until layout and final editing is done. I can at least though get the single patterns into your hands as soon as it goes on pre-release - I'll follow up shortly with more info on that. I've been thinking about release schedules and how mine is all over the place, because I had a few months forced break earlier in the year. I'm still playing catch-up as we head into the busy season and I know from experience this isn't a good place to be if I want to get the most out of it. Knowing this is what’s behind most of my stress right now - if I can’t produce, I can’t earn. And the way my business works is that I don’t see the downsides of a problem like two frozen shoulders until the next financial year. When Aran was critically ill and we faced eviction I did very little work for 6 months. The (financial) year this all happened in was fine, pretty normal… but it was the next (financial) year that saw a 25% drop in earnings. And that’s a lot, especially on a relatively low income that the whole family relies upon. And so yeah, that’s what’s eating away at me. Lateralis should have been ready for September 1st but I couldn’t knit and finalise the patterns, so it wasn’t. That then had a knock-on effect for the rest of the team who brilliantly help me produce my eBooks. I’ve missed at least a whole month of earnings on the collection at a time when we could really use it. What I earn between September and January has to keep us going until the following September, and that usually dries up come end of August. Right now, we’re living on our savings, the savings we put aside to pay for pt2 & pt3 of our #brexitscapeplan…. so, yeah. Anyway. On the upside, Rhinebeck will be fun and Lateralis will be a hit, yes? I worry about the size of the Hats I make. It's an odd blog title, but it's true all the same. I worry about the sizes of the Hats I make. I'll try and avoid veering into my usual rant about how one size doesn't fit all, or even most. If it's a gradable pattern, I just think taking this road is lazy when it comes to Hat design. Even my patterns that can't be graded by the stitch count or pattern repeat are still graded by gauge. There - I've got that out of the way! Dancette (right, above) is one Hat I always use in my sideways knit classes to demonstrate not only how fun garter stitch can be on it's side, but also how stretchy it is. I haven't found a head yet in one of my classes that it won't go on. But just because a Hat goes on doesn't mean it fits. As a knitted fabric stretches widthways, it'll take up in length. It's not rocket science really; garter stitch is daftly yarn thirsty and in turn is daftly stretchy. But even garter stitch will get shorter as it gets wider - it can't magic yarn or stitches out of thin air. And because I get myself all worked up about this, I spend a lot of time trying to decide which sample size I should make in the pattern. It's especially tricky because I don't usually know who will be modelling, and few of my models will have the same head size. I usually end up erring on the side of caution, and making a slightly larger size than I expect. If there's a 22in size, that's the one I go for. Because if my model turns out to be smaller, then the Hat's a little big - whilst it won't be ideal for braving the elements, it'll not look too awful in a shoot. But if a Hat is too small for a model then you can bet it'll look pretty crap. When I was working on Painted Woolly Toppers, I reknit Dancette 3 times. It's a skinny fit beanie so it wants to have a fair amount of negative ease, but not too much. And I spent ages deliberating over differences that really didn't amount to more than half an inch, which in hindsight is unnecessary and I really should have words with myself. But it's a habit I can't seem to break. Yet I must, else I'll pay with my shoulders. The sample above left is the first design from the new book, and it's folded and compared to Dancette. It's exactly the same size. However, the gauge has actually run smaller than I was expecting and the Arroyo looks very happy at this gauge, so I think I'm going to knit another sample in DK. Because yes, Dancette fits but the new one won't, because stretching out all of those short rows will look a mess; you don't want quite as much negative ease with these kiddies. We're putting a lot of work into getting me better, into reducing the pain and improving my range of movement. As much as I didn't want to go anywhere near the Amitriptyline again, I'm on twice the dose this time and it's doing it's thing - it's getting me to sleep, and along with all the other pain management methods, the pain is now liveable. We've bought ourselves a hand-held ultrasound unit, and that's making a difference (yes, we've done our research and we're using it conservatively). I'm having two massages a week, one specifically to focus on all the scar tissue from inflammation around all the muscles (there's a heck of a lot of it) and we're mighty grateful to be good friends with a talented masseur who's friends' rates means I can get two long, deep massages for less than the price of one in London. And of course, if the damp/cold weather kicks in or I've somehow pushed things too far, I've the TENS machine at hand. For the last 10 days or so, I've not needed to use that everyday, so I'm definitely on the right side of this now! And of course I'm doing physio at least 5 times a day (I'm a pro at the pendulum exercises these days). And all of this means I can knit again! Not constantly, I need regular breaks and days off in between, but I can knit. My tension isn't a mess, either. And so I'm diving straight into the designs that I've been working on for what feels like forever. There's only so much work on paper I can do before I get bored and move on, so I'm relieved not to have lost enthusiasm for this idea. I started by making myself a prototype for the construction. BTW, the Turning Heads collection is still something I hope to see published, but it's in a kinda weird limbo - that's what happens when you have a breakdown during a project; that project becomes associated with the breakdown, or at least it's very hard to revisit it at a later date. Given that my brain is very much back on track in terms of puzzle solving and pattern maths and construction, the concept behind Turning Heads feels within my grasp again. But that's somewhere in the future. So here's a look at how the crown shaping works with this construction method. It's a sideways knit Hat without short row shaping. And this is how it looks from the side. It is still very much a sideways Hat; garter stitch sideways is essentially 1x1 rib, except with loads more possibilities design wise, and better properties stitch wise. 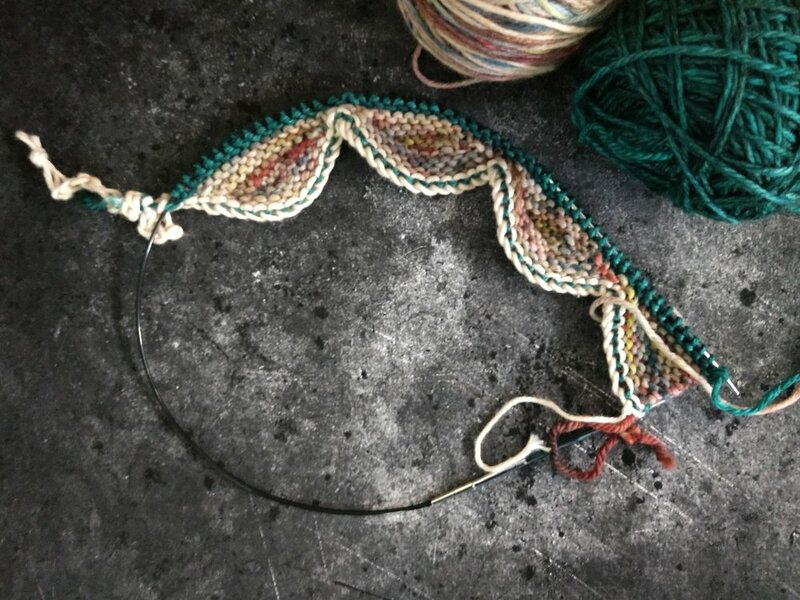 Recalculating the maths of this construction method for garter stitch was easy enough - the gauge properties of garter stitch sit so well with that of sideways knitting - if you've ever taken one of my sideways knitting workshops with me you'll know I wax lyrical about this! After a false start and a ripping out (it's how I work best!) I'm fully underway with the pattern. Although there's no short rows involved in the construction, I wanted to throw in some short row colourwork, because I wanted to see how the two play together. It's making for some mind boggling charts and rather fascinating problem solving, as increases/decreases are working at 90 degrees to the short rows, and they don't always play when when they don't intersect at the right points. But I'm thoroughly enjoying myself working it all out! It's absolutely been worth all the effort, I'm mighty chuffed with how this first design is taking shape! The collection will be called 'Lateralis'. If you follow me on Instagram you'll know I've spent some time trying to decide between laterale and Lateralis... the Latin does have a medical usage and I do try and use a word that doesn't have alternative meanings, but it is absolutely the best word for the idea behind this collection. Lateralis literally means 'belonging to the side' and is the original of the words and usages of 'Lateral', as well as the origin behind some of the pattern names, too. The Italian sounds good following on from Elemental and Circled, but it doesn't strike me as quite as sophisticated as the Latin, and these patterns (and the photography I have planned for them) are definitely more sophisticated than anything I've done (in my opinion, at least!). So Lateralis it is. I'll get a webpage built for the collection as soon as I have some good photos of the finished Hats to share. Release date wise, it'll be in autumn. I'm not going to be more specific than that as my shoulders are dictating my pace right now, and I want to be free to indulge myself in the designs so that I produce the best stuff, rather than feel committed to a deadline, which usually results in my not best stuff. Likewise, it'll be 4 or 5 designs, but I'm not committing to that either. To knit the prototype I used Bloomsbury DK from The Yarn Collective, the same yarn that I used for the Elemental collection. As for the pattern sample shown above, I've used Malabrigo Arroyo. These Hats will be graded by gauge, and I'm writing in 3 sizes that cross sport weight and DK. Chances are I'll be reknitting this one in DK for the photoshoot, as the Arroyo does make a smallish size... I tend to find Arroyo is on the skinnier side of the sport weight scale. I'll publish the gauges vs sizes in the near future, but for now I'd say if you're knitting adult size Hats, DK is what you wanna be stocking up on. Right, onwards! I've a weekend of chart wrangling ahead. Hope you like the new stuff! We'll be taking our first foot steps on Indian soil as this post goes live, and it feels rather poignant that I'm celebrating the 10th anniversary of my first book - a whole chunk of sideways knit Hats - as we take a well earned break paid for by another book of sideways knit Hats! I've always enjoyed designing sideways knit Hats, it's where I feel most at home and most challenged. For a while back there I didn't design so many and some books (such as Classic Woolly Toppers) didn't feature any at all, as they just didn't seem to be gathering much interest. I'm much, much more confident now in designing what I want and exploring different construction methods, and in them being well received, too. I've said before that Going Straight is my worst selling book and also my most pirated; that's still true and it still feels like a shame. I've learnt so much since publishing this book - about photography and colour/yarn choices for patterns. About layout and self publishing through POD. And also about short rows and grafting! For it's time, there was nothing else like it around and it kinda went under the radar. It's the book I've spent more time updating and tweaking than anything else, and I secretly hope that one day it might yet have it's moment. For the next few of days I'm offering a promotion on Going Straight either here or on Ravelry. Use code 10yearsofsideways to get 50% off the price between now and midnight on Xmas day (GMT). And I'll be hopefully posting very soon with photos of our India adventure - expect lots of textiles, silver jewellery, architecture and family fun (I can't wait to see Aran's face as he rides an elephant. That's how we plan to spend xmas day!). Erm, yes, I'm totally going to brag! I've been nominated for the Best Designer award in the Knitting category. And I'm not just here to brag.... I'm gonna ask if you'll kindly go and vote for me? There are some great folks who've been nominated - Stitchmastery for best product, Knit British for best blog, Baa ram Ewe for best yarn brand (hint, hint) and more.